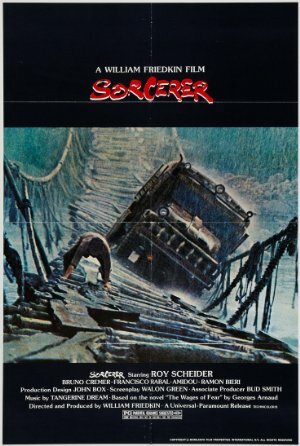 The Dissolve: It’s only fitting to bring fate into the discussion of William Friedkin’s Sorcerer, which takes its name from the cruel, implacable force twisting the lives of four men driving trucks filled with volatile nitroglycerin through the Central American jungle. Fate decreed that Friedkin would balk at Steve McQueen’s demands, leaving him to settle on the less-bankable Roy Scheider as his leading man; fate delayed the production as Friedkin built, tore down, and rebuilt a rickety road bridge across a swollen river for the movie’s most jaw-dropping sequence; and fate saw that the movie, his first after the massive success of The Exorcist, opened in the midst of Star Wars’ unstoppable theatrical run, and was quickly swept out of theaters and into history’s dustbin. Slant: Sorcerer is, after all, a remake of Henri-Georges Clouzot's The Wages of Fear, though credited in the film as an adaptation of Georges Arnaud's novel. Clouzot's film is a vanguard work because of its insistence that rigorous formal and philosophical inquiry can take place within the confines of genre. Friedkin adheres to these underlying principles, but seeks further reconciliation between spectacle and cinematic philosophy. Jackie Scanlon (Roy Scheider), along with Kassem (Amidou), complete the quartet of men eventually exiled to Porvenir, Chile, which is in midst of political upheaval. “UNIDOS HACIA EL FUTURO” (translation: “United Toward the Future”) is the message painted on various walls. Of course, Scanlon and company must be as well if they wish to escape their current fates, which prompts the film's famous narrative conceit: transporting sensitive explosives across a treacherous terrain. However, Scanlon is haunted by his past mistakes, making him a Janus-faced figure for postmodern discontent; he's unable to move forward, but also unsuccessful in negotiating his past deeds. Friedkin finds these themes amid radical set pieces; a 10-minute struggle to get a truck over a bridge during an intense thunderstorm constitutes some of the finest sound mixing in Hollywood, perhaps cinematic history, rivaling the battle on the ice in Alexander Nevsky. I saw this movie last year. I forget who suggested it, but it wasn't the type of film I would normally watch. But I'm so glad I did. It was really an amazing movie. I never thought I would get so involved in the characters. I originally saw this in the theatre when it came out, either because I had the Tangerine Dream album, or I bought the TD album because of it. However, being the theatrical cut, it lacked the 20-30 minutes at the beginning. I rewatched it a couple of years ago in complete form, and the missing segment changed it from just a seat-gripper to a story about people you are meant to get attached to. The bridge sequence is certainly memorable, but to see it in context gives it a deeper meaning. One of the movies I am really glad I saw. I'm a little skeptical that the blame for this film being obscure can be completely laid at Star Wars' feet. They would appeal to very different audiences, after all. I think what they're saying is: "Well, I'd there wasn't a film out there that kettle liked, then they would totally have gone to our film." I actually haven't seen it, despite liking Freidkin and liking the cast. Because The Wages of Fear is so perfect a word of suspense that even a non-literal remake seemed superfluous. But not I'm thinking I'm just being a stick in the mud and will probably see this soon. Friedkin's recent interview with Marc Maron is really interesting. They talk about Sorcerer a little bit.